It is a handmade hand camera strap wrapped with colorful silk thread and crazy color step dyed hemp and wood beads at point. Since silk threads differ in color due to parts and balls, only one strap can be made in the world. 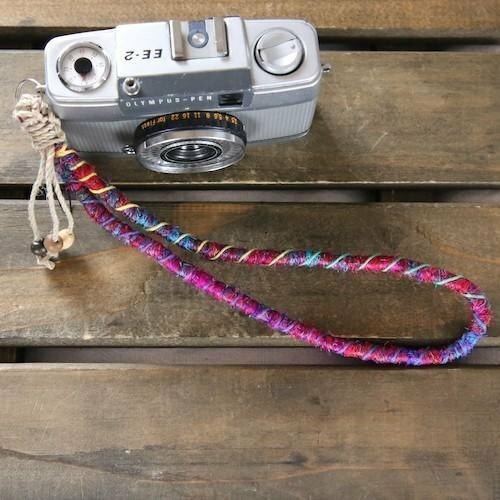 It is a handmade hand camera strap wrapped with colorful silk thread and crazy color step dyed hemp and wood beads at point. Wood beads become assorted. (It is also possible to manufacture without wood beads, because wood beads are natural materials, there may be color unevenness, scratches, dents) Since silk threads differ in color due to parts and balls, only one strap can be made in the world. (Therefore, please understand that there are some differences in color taste with sample photos) Length: Approximately 23 cm (measured with straight line including double ring) / Mobile strap type metal fittings are about 5 cm long Since length can be changed, please tell us if there is hope. It can be used with relatively light compact cameras and toy cameras. (The reference camera's camera is about 342 g with Olympus pen EE 2) It can also be used with mobile phones and smartphones. <About the mounting part> Double rings and mobile strap type metal fittings are included. (Cell phone strap type metal fittings are removable) Even when installing, remove the mobile strap type bracket from the double ring and attach it to the camera, then attach it to the double ring of the strap body easily and detach it. ◆ It is also possible to produce fasteners with belt type or NASCAN so we are happy to give you a message. ◆ There is also a neck strap with one point hanging camera strap with two points suspended in the same series. About hemp (hemp) Hemp (hemp) is an environmentally friendly plant that does not require scientific fertilizers or agricultural chemicals because of the cannabis cannabis. Our hemp is using the highest grade hemp from Romania. It is durable and long-lasting, it is 100% natural material which adapts to your skin when you use it. Because it is less fluffy and soft, it was not scratchy even when it was hanging around the neck, and garbage did not stick to clothes. (There are individual differences in how you feel) -------------------------------------------------------------- ◆ This item will be made after ordering. (About + 2 days after payment) ◆ 1 point 1 point Because of handmade, something is different even in the same item, but the stitches are irregular. Please kindly purchase after understanding in any way. **Purchase notes** ◆ This item will be made after ordering. (About + 2 days after payment) ◆ We will correspond as much as possible when we wish for non-listed delivery methods. ◆ 1 point 1 point Because of handmade, something is different even in the same item, but the stitches are irregular. Please kindly purchase after understanding in any way.